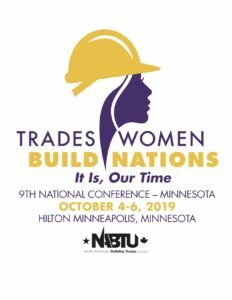 Welcome to the 2019 Trades Women Build Nations conference official page! Over the years, because of your dedication, this conference has grown and grown. With that growth, we have experienced many changes. Some of those changes have left former websites and social media sites with stale information. Even though we appreciate the enthusiasm of our many volunteers who want to communicate conference information, the leadership of the Women in the Trades committee want to make sure you get all the correct information. With that being said, the official place for 2019 conference information is this site www.nabtu.org/twbn. You may also receive information directly from your international.